Spare land adjacent to the back of your house? A rear house extension could provide the extra bedrooms, second bathroom, kitchen extension with nice French doors or shower room for the expanding family, or the badly needed study away from the hustle and bustle of the common living areas. Kitchen extensions to the rear of the property are becoming increasingly popular as a way of gaining more ground floor living space, whilst using up the view and open access to the garden. Maybe you even want to accommodate the needs of a growing family, working from home or a hobby then two storey rear extension might be the thing you are after. Rear extensions often done as single storey kitchen extension opening up view to your garden and giving you the extra dining area. We specialise in designing and building extensions to Victorian terrace properties that have that extra garden space at the back, we have a nifty range of roof lights type windows and wide glass French doors to get most of the natural light as part of many of our designs. Building a rear extension can make good financial sense too. You can significantly improve the value of your house by adding that extra space. No more than half the area of land around the "original house" (meaning the house as it was first built or as it stood on 1 July 1948 (if it was built before that date). Although you may not have built an extension to the house, a previous owner may have done so.) would be covered by additions or other buildings. 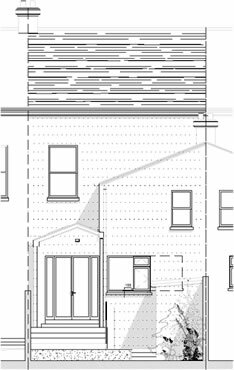 Maximum depth of a single-storey rear extension of 3 metres for an attached house and 4 metres for a detached house. Maximum height of a single storey rear extension of 4 metres. Maximum depth of a rear extension of more than 1 storey of 3 metres including ground floor. Maximum eaves height of an extension within 2 metres of a boundary of 3 metres. Side extensions to be single storey with maximum height of 4 metres and width no more than half that of the original house. 2 storey extensions no closer than 7 metres to the rear boundary. Roof pitch of extensions higher than 1 storey to match existing house. Materials to be similar in appearance to existing house. Upper-floor, side facing windows to be obscure glazed; any opening to be 1.7 metres above the floor. On designated land such as national parks and the Broads, Areas of Outstanding Natural Beauty, conservation areas and World Heritage Sites - no permitted development for rear extensions of more than 1 storey.